Sergei Alexashenko, former Deputy Finance Minister and deputy governor of the Russian Central Bank, speaks in an exclusive interview about economic challenges currently facing Russia. He talks about sanctions, crisis management, the need for reform, and the country’s dependence on oil. RIR: Economic experts have recently been speaking about a thaw in relations between Russia and the West. Does this mean the situation will now improve? Sergei Alexashenko: I personally don’t see any rapprochement. There is some limited dialogue on Syria, but the problems in relations are much more profound. And until the Minsk Agreements [on resolving the conflict in eastern Ukraine – Ed] are fully realized, the sanctions will stay in place. RIR:Let’s say the sanctions are lifted. Will this help the economy? S. A.: In my view, the problems in the Russian economy are not mainly due to the sanctions and the low oil prices. In 2013, when there were no sanctions and oil prices were high, we saw an economic growth of only 1.3 percent. External factors had nothing to do with this. Concerning technological sanctions in the energy sector, they are basically not producing any results because they are aimed at offshore production which, at today’s oil prices, is unprofitable anyway. If the financial sanctions are lifted, this will obviously lead to short-term improvement. However, without an increase in investments, long-term economic improvement is impossible. RIR:A year ago, when the ruble was falling fast, many spoke of Russia's economy collapsing. Why didn't it happen? S. A.: What happened a year ago can indeed be called a perfect storm. Many factors coincided at that time: oil prices, the sanctions, a peak in payments of external debt. This led to the collapse of the national currency. But we shouldn't overestimate the role of the financial market in general. It was clear that a reasonable policy formulated by the Central Bank would be able to calm the situation. The apocalyptic forecasts came from those who don't understand how the monetary system works. Certainly, the fact that oil prices rose a bit at the beginning of the year helped. Also, today the Central Bank is committing fewer errors than it did last year. The bank's biggest problem now is its inability to clearly explain its inflation-regulating actions to the public. RIR:How do you evaluate Russia’s economy this year? S. A.: I can’t say that it has been catastrophic. In comparison to the 2009 crisis, its position is much better. Also, this year it became evident that the Russian economy is relatively stable because it has indeed become a market economy. Sure, corruption persists, but there are also free market prices, a free exchange rate. When the exchange rate and prices adapt, in the end market forces always restore their balance. This obviously involves the reduction of consumption and the patience of the population, which is still ready to stoically endure the burden. The fact that in the last 15 years there were no significant attempts to regulate prices means that President Putin is familiar with this market advantage. RIR:Are all the sectors in Russia’s economy in equally bad shape at the moment? S. A.: Not at all. The differences are great. The defence industry is doing exceptionally well; defence orders are growing consistently. This in part has led to growth in industrial production in the past few months. The agrarian sector traditionally finds itself in a good state. In the beginning of the 2000s Russia created a more or less functional agrarian subsidy system, thanks to which this sector is growing today at a rate of 2-3 percent. The ban on import of food products benefited the agrarian system even more. The raw material and transportation sectors were able to preserve their stable levels because the physical demand for Russian raw materials did not decrease. The consumer market, however, is not doing so well: trade, the car industry, development projects, real estate. RIR:You mentioned investments. This year Russia was ranked 51st in the Doing Business Ranking, while five years ago it was 120th on the list. Were the reforms really so successful? S. A.: Sure, there were successful reforms, even though they were related more to electronic services for interacting with fiscal organs or to the acceleration of separate bureaucratic procedures. But such ratings often measure only technical parameters, that is, how fast and at what price a citizen can receive a service from the government. However, the rating does not pay attention to the quality of the institutions. Based on the fact that the Russian court is faster than, let’s say, the American one, it cannot be said (as the Doing Business Rating says) that agreements and property are better defended in Russia. On the one side of the scale there are the technical parameters; on the other you have the entrepreneur’s risk of losing his property in court. For investors, the latter is more important. RIR:How do you evaluate the Russian government’s crisis management at the moment? S. A.: The right cure requires the right diagnosis. And with this there are problems. Russia’s main problems are a poor investment climate and inadequate legal protection for private property. The government is mostly concentrating on external factors. It sees problems with the sanctions and is trying to make the economy autonomous, which actually can be harmful. Not one country has been able to create long-term growth with import substitution. RIR:How do you see the Russian economy in the next year? S. A.: It’s difficult to make short-term predictions. Basically, it is rare that an economy experiences a recession for more than two consecutive years without some kind of catastrophe. For this reason alone Russia should return to growth. The problem is that without a growth in investment this dynamic will be rather unstable. RIR:But the investment climate was not any better in the past. Yet there was growth. S. A.: This began in the last 10 years and the Yukos case worsened matters even more [Yukos investors claim that the Russian court was not acting in good faith when criminal proceedings against Yukos resulted in bankruptcy. Shareholders are trying to win back more than $100 billion in various international court cases – RIR]. The economy is rather unwieldy and depends not on the decision of several investors but on thousands of entrepreneurs. That is why events such as the destruction of Yukos gradually have an impact on the economy. Before the beginning of the financial crisis, Russian banks and enterprises could borrow abroad an amount equal to 7-10 percent of GDP. The economy was growing. After the crisis, in 2010-2011, Russia experienced a rebound effect and only in 2012 did we reach a pre-crisis level. From that time there has been no growth. RIR:Would an increase in oil prices help? S. A.: Russia’s dependence on oil is obviously great but it shouldn’t be overestimated. If the price reaches $100 certainly things will get better. For a year or two. But in principle nothing will change. The government’s strategy cannot be based, bluntly speaking, on weather forecasts. What’s necessary is the improvement of framework conditions for doing business and the increase of legal protection, guaranteed by an independent judiciary. For this, political competition and an independent media are fundamental. Without them it will be difficult for the Russian economy to get out of the quagmire. 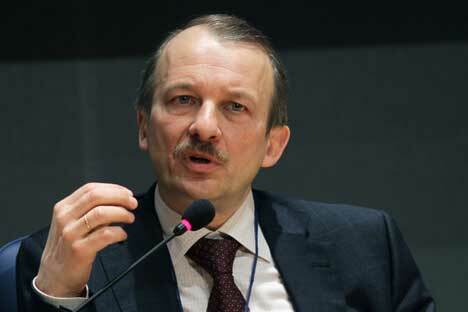 Sergei Aleksashenko is Russia’s former deputy minister of finance and former deputy governor of the Russian Central Bank. A previous scholar-in-residence in the Carnegie Moscow Center’s Economic Policy Program, he is currently a non-resident senior fellow at the Brookings Institution in Washington, D.C.